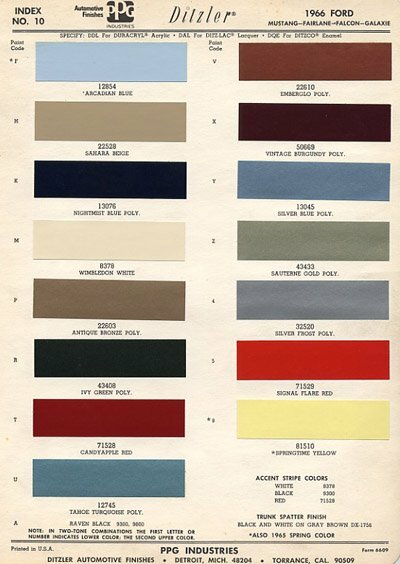 The 1966 Mustang paint colors by paint code included a total of 16 choices for the second year of production. three more production colors that became part of the 1967 Mustang colors. The paint code color listings marked with an asterisk (ie. Springtime Yellow (code 8) and Arcadian Blue (code F), were produced no doubt, to generate spring sales. If you are in the process of restoring your 1966 Mustang or just wondering if your car is wearing the color that matches your data plate, the paint color chart and the corresponding letter or number Mustang paint codes will give you the answer. Looking at the sample data plate below, you can the areas which list the codes for your car (ie. body style, exterior color, trim level, date manufactured, district sales office, axle ratio and transmission type). On the 1966 Mustang you'll find the paint code letter located on the data plate, which is riveted (on an angle for some strange reason) to the drivers door. Maybe you have a drivers door from another Mustang. Or maybe your original plate is just too beat up and covered with paint over spray to salvage it. What can you do? Well, you have a few choices. Whether you are trying to find the correct paint codes and other required information needed to replace your missing plate or using it for figuring out what the original 1966 mustang paint colors were on your car when it left the factory and whether you have the correct paint. The good news is, that if yours is missing, there are several companies selling a reproduction data plate and some original style tap-in rivets to solve the problem. The rest is going to be a bit of detective work to find out the codes for the rest of the information you'll need to get your new one made with your specific vehicle information. Ok. Assuming that you still have some original color somewhere on your car, it's time to become a bit of a detective. The two most likely places you are going to find some original paint and figure out what color it's supposed to be, is either deep in your trunk, or on a piece of the original floor. First, the bad news. Classic Mustangs usually have rusted floors, meaning they may have had a floor pan replacement (or they need one). The good news, however, is that most replacement jobs don't require replacing the sheet metal on the transmission hump and if all else fails, that's where you'll want to look for some original paint. If your 1966 Mustang's floor pans are original, then the easiest way to see what's under there, is to remove one of the silver rocker covers at the door and lift up your carpet and have a look. Got a piece of that floor or an original part with the OEM color on it? Great! If it's small enough or going to be trashed, so you can cut it up, take it down to your friendly neighborhood automotive paint store. Many now have a special electronic analyzer that basically takes a picture of your paint and matches it with it's database to figure out both, the paint code and color.